Kenny Kellogg: Well, They Had to Try Something...Why Not This? 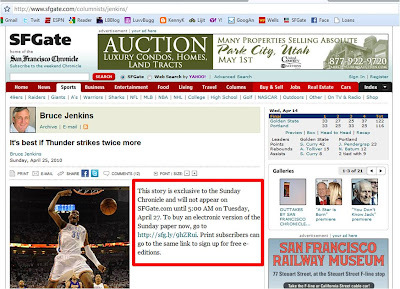 The San Francisco Chronicle went to a modified pay wall. Unfortunately, my favorite sportswriter, Bruce Jenkins, appears to be blocked until 2 days after the original day his articles run. I'm glad the Chronicle is experimenting because I want it to find a way to stick around, but this a bummer because now I'm rarely going to read one of my favorite writers. I could always subscribe, right? An annual subscription to the Chronicle Electronic Edition costs about $100. To provide some context, I pay about $35/year for ESPN Insider access which let's me read all of ESPN's best writers. However, ESPN is pretty weak on local coverage, so I'm really paying $35 for the national writers. The Chronicle has chosen to bundle all of it's content together, "horizontally", instead of stripping it out into "verticals": Sports, Finance, Entertainment, Politics, Food, etc that could get purchased independently for a lower cost. The horizontal bundling strategy seems outdated because I read "Best of Breed" writers who are the definitive experts in their category. Old Newspapers could get away with the horizontal bundling strategy because they were the only game in town, but now I can pop over to Hollywood Reporter & What Would Tyler Durden Do for Entertainment news, Yahoo Finance & Infectious Greed for Finance news, and so on. Here's a suggestion: Cut a Revenue & Content sharing deal with ESPN so that the SF Chronicle writers I love appear on ESPN.com. ESPN already has my credit information so it's an easy upgrade path, the Chronicle takes a $X commission on every upgraded sale, and ESPN solidifies its position as best of breed in Sports content. The pie is expanded for everyone, right?